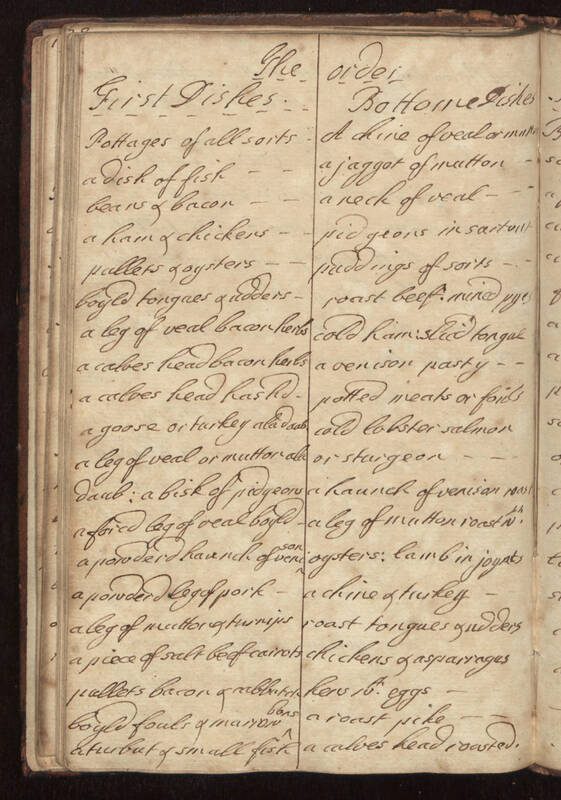 The Order First Dishes Pottages of all sorts - a dish of fish - beans & bacon - a ham & chickens - pallets & oysters - boyld tongues & udders - a leg of veal bacon herbs - a calves head bacon herbs - a calves head hashd - a goose or turkey ala daub - a leg of veal or mutton ala daub; a bisk of pidgeons - a forcd leg of veal boyld - a powderd haunch of venison - a powderd leg of pork - a leg of mutton & turnips - a piece of salt beef carrots - pallets bacon & cabbatch - boyld fouls & marrow bons - a turbut & small fish Bottome Dishes A chine of veal or mutton - a jaggot of mutton - a neck of veal - pidgeons in sartout - puddings of all sorts - roast beef; mincd pyes - cold hams; slicd tongue - a venison pasty - potted meats or [foils?] - cold lobster salmon or sturgeon - a haunch of venison roast - a leg of mutton roast wth. oysters; lamb in joynts - a chine & turkey - roast tongues & udders - chickens & asparragus - hens wth. eggs - a roast pike - a calves head roasted.